When you're ready for the more comprehensive notation and scoring capabilities of Finale, you'll be glad you started with PrintMusic 2014. 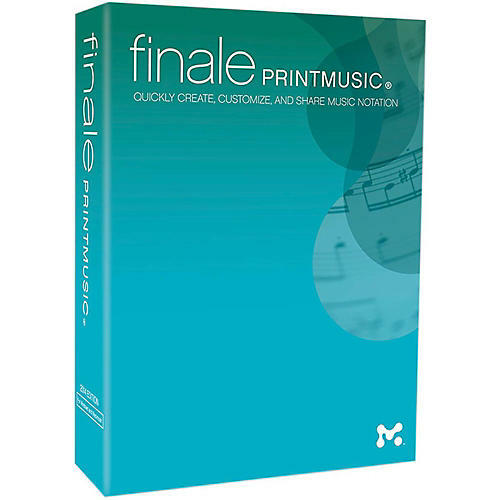 You can save PrintMusic 2014 files in a format that Finale 2012 and Finale 2014 can open, giving you more flexibility with your scores in the future. It also means you can have more flexibility to collaborate with other musicians and composers. Whether you're writing a lead sheet for your first song, or preparing a score and parts for your next concert, PrintMusic music writing software makes it easy to put your music on the printed page. But that's just the beginning. With PrintMusic your music plays back with great sounds and nuance, providing you with instant feedback on your progress. PrintMusic offers creative suggestions-from harmonizing melodies to providing drum parts-to fuel your creativity and save time. Most importantly, PrintMusic produces great sheet music that will inspire your performers to play even better. Order today and notate for rehearsals and performances without breaking the bank. Finale family software can open files that were created in the same or older software version, but files created in a newer version cannot be opened in an older version unless converted via MusicXML. PrintMusic 2014 and Finale 2014 are exceptions to this rule as they can also save Finale 2012-compatible files.